Alan Harvey Guth (born 27 February 1947) is an American theoretical physicist and cosmologist. Guth has researched elementary particle theory (and how particle theory is applicable to the early universe). In particular he discovered and developed the theory of cosmic inflation. as quoted by Stephen Hawking (1988). A Brief History of Time. Bantam Books. p. 129. ISBN 0-553-34614-8. Alan Guth and Paul Steinhardt, The inflationary universe, edited by Paul Davies (1992). The New Physics. Cambridge University Press. p. 54. ISBN 0-521-43831-4. It becomes very tempting to ask whether, in principle, it's possible to create a universe in the laboratory—or a universe in your backyard—by man-made processes. "A Universe in Your Backyard," in Third Culture: Beyond the Scientific Revolution (1996) ed. John Brockman. It turns out that the energy of a gravitational field—any gravitational field—is negative. During inflation, as the universe gets bigger and bigger and more and more matter is created, the total energy of matter goes upward by an enormous amount. Meanwhile, however, the energy of gravity becomes more and more negative. The negative gravitational energy cancels the energy in matter, so the total energy of the system remains whatever it was when inflation started—presumably something very small. ...This capability for producing matter in the universe is one crucial difference between the inflationary model and the previous model. "A Universe in Your Backyard," in Third Culture: Beyond the Scientific Revolution (1996) ed. John Brockman, p. 279. We should not act like we know that the universe began with the Big Bang... we'll see that there are strong suggestions that the Big Bang was perhaps not really the beginning of existence, but really just the beginning of our local universe, often called a pocket universe. Lecture 1: Inflationary Cosmology: Is Our Universe Part of a Multiverse? Part I. What the Big Bang theory tells us, is that at least our region of the universe 13.82 billion years ago, was an extremely hot, dense uniform soup of particles which in the conventional standard Big Bang model filled literally all of space—and now we certainly believe that it filled essentially all of the space that we have access to—uniformly. ...This is contrary to a popular cartoon image of the Big Bang, which is just plain wrong. The cartoon image of the Big Bang is the image of a small egg of highly dense matter that then exploded and spewed out into empty space. That is not the scientific picture of the Big Bang. ...If there was a small egg that exploded into empty space, you would certainly expect that today you would see something different if you were looking towards where the egg was, versus looking the opposite direction, but we don't see any effect like that. When we look around the sky the universe looks completely uniform, on average, in all directions, to a very high degree of accuracy... So we don't see a sign of an egg having happened anywhere. Rather, the Big Bang seems to have happened everywhere, uniformly. The conventional Big Bang theory does not say anything about what caused the expansion. It really is only a theory about the aftermath of a bang. In the scientific version of the Big Bang, the universe starts with everything already expanding, with no explanation of how that expansion started... So the Scientific version of the Big Bang theory is not really a theory of a bang, it's really a theory of the aftermath of a bang. The conventional Big Bang theory says nothing about where all the matter came from. The theory really assumes that for every particle that we see in the universe today, there was, at the very beginning, at least some precursor particle, if not the same particle, with no explanation of where all those particles came from. In short what I like to say is that the Big Bang says nothing about what banged, why it banged, or what happened before it banged. It really has no bang in the Big Bang. It is a bangless theory, despite it's name. Inflation is a prequel to the conventional Big Bang theory. ...It does provide a theory of the propulsion that drove the universe into this humungous episode of expansion which we call the Big Bang. The miracle of physics that I'm talking about here is something that was actually known since the time of Einstein's general relativity; that gravity is not always attractive. Gravity can act repulsively. Einstein introduced this in 1916... in the form of the cosmological constant, and the original motivation of modifying the equations of general relativity to allow this was because Einstein thought that the universe was static, and he realized that ordinary gravity would cause the universe to collapse if it was static. ...The fact that general relativity can support this gravitational repulsion, still being consistent with all the principles that general relativity incorporates, is the important thing which Einstein himself did discover..
Inflation takes advantage of this possibility... to let gravity be the repulsive force that drove the universe into the period of expansion that we call the Big Bang. In fact, when one combines general relativity with conventional ideas, now, in particle physics there really is a pretty clear indication, I should say, not quite a prediction... that at very high energy densities one expects to find states of matter which literally turn gravity on its head and cause gravity to become repulsive. What it takes to produce a gravitational repulsion is a negative pressure. According to general relativity, it turns out... both pressures and energy densities can produce gravitational fields, unlike Newtonian physics, where it's only mass densities that produce gravitational fields. A positive pressure produces an attractive gravitational field... Positive pressures are just sort of normal pressures and attractive gravity is normal gravity, so normal pressures produce normal gravity, but it is possible to have negative pressures, and negative pressures produce repulsive gravity, and that's the secret of what makes inflation possible. A very plausible choice for when inflation might have happened would be when the energy scales of the universe were at the scale of grand unified theories... which unify the weak, strong and electromagnetic interactions into a single unified interaction. ..we're talking about energies which are about 1016 times the equivalent energy of a proton mass. ...the initial patch would only have to be the ridiculously small size of about 10-28 cm across to be able to lead ultimately to the creation of everything that we see on the vast scale of which we see it. The gravitational repulsion created by this small patch of repulsive gravity material would be, then, the driving force of the Big Bang and it would cause the region to undergo exponential expansion... there is a certain doubling time, and if you wait the same amount of time it doubles again, and if you wait the same amount of time it doubles again... and it's because these doublings build up so dramatically, it doesn't take very much time to build the whole universe. In about 100 doublings this tiny patch of 10-28 cm can become large enough, not to be the universe, but to be a small marble-sized region which will then ultimately become the observed universe, as it continues to coast outward after inflation ends. The discovery of the CMB cemented the notion of a big bang. But for all its elegance, the theory had thrown up some intractable problems. Soon after the CMB was discovered, Dicke went to Cornell to talk about... the flatness problem. ...the universe seemed to be flat, meaning that the ratio of actual matter density to the critical density... Omega, was very close to 1. And for today's universe to have Omega anywhere near 1, its value just one second after the big bang had to be exactly 1 to a precision of about fourteen decimal places. Nothing in the laws of physics suggested why... In Dicke's audience was a young postdoc named Alan Guth. He was a particle physicist who had no interest in cosmology. But something about the talk tickled his fancy and set him on a journey that would solve the big-bang theory's most frustrating problem. Anil Ananthaswamy, The Edge of Physics: A Journey to Earth's Extremes to Unlock the Secrets of the Universe (2010). Tai L. Chow, Gravity, Black Holes, and the Very Early Universe: An Introduction to General Relativity and Cosmology (2007). According to Guth, he had discovered the equations of De Sitter's cosmology (1917), written in the form introduced somewhat later by Georges Lemaitre (1925), as part of his MIT Thesis, before introducing inflation as the starting point of his new cosmology. After taking care, by means of inflation of the "monopole problem". ...Guth went one step further to solve the so called "flatness problem". ...Guth finally goes on to explain how his theory of inflation solves the "horizon problem". ...we will analyze in some detail to what extent the "monopole problem", the "flatness problem" and the "horizon problem" require, or not, cosmic inflation as a problem solving "paradigm". Julio Antonio Gonzalo, Inflationary Cosmology Revisited: An Overview of Contemporary Scientific Cosmology After the Inflationary Proposal (2005). Prior to the downfall of the GUT in the mid 1980s, Alan Guth, an elementary particle theorist, was trying to explain the scarcity of the magnetic monopoles in the universe. The standard cosmological model predicted that there should be as many monopoles as there are nucleons! Since all attempts at finding a monopole had failed, Guth suggested that the universe must have had an inflation phase during which it expanded exponentially. This exponential growth was so rapid that it diluted any existing monopoles so much so that today there may be only a few in our observable universe. Sadri Hassani, From Atoms to Galaxies: A Conceptual Physics Approach to Scientific Awareness (2011). John Hussey, Bang to Eternity and Betwixt: Cosmos (2014). 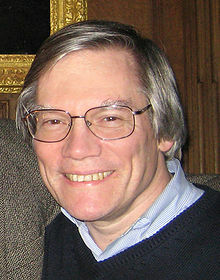 It was fortunate that Alan Guth did his work at the same time that another idea came into fashion, which was the theory that we could understand why the universe contains matter and not antimatter in terms of some asymmetry, some favoritism for matter over antimatter in the early universe; it's no good having a scheme that can inflate the universe to enormous dimension of it's not possible to create matter to fill that large universe. Martin Rees, Third Culture: Beyond the Scientific Revolution (1996) ed. John Brockman.